While the women’s race today at IRONMAN South Africa took the primary focus from a British perspective, a strong field also lined up for the $30,000 first prize on offer in this African Championship race. 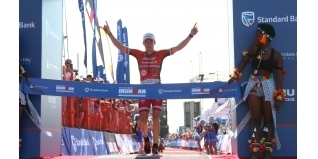 A close race saw Ben Hoffman (USA) – second at Kona in 2014 – take the tape first in what was a very close and competitive race throughout. Estonian, Marko Albert was the fastest athlete in the water and was first into T1 followed by Eric Watson (BAH) and Bas Diederen (NED) in the lead group. A second group of Ben Hoffman (USA), Mark Oude Bennik (NED), Christian Kramer (GER) Tim Van Berkel (AUS) and Kyle Buckingham (RSA) followed all within seconds of each other. Albert worked hard to open up a two-minute gap together with Bas Diederen (NED) and American Benjamin Collins on the first 45 kilometers. Those guys knew that they had dropped some strong cyclists and runners in the water like the local heroes James Cunnama (51:54) and Matt Trautmann (54:17), Hoffman (52:58), Germany’s Boris Stein (54:23) and 2013 champ Ronnie Schildknecht from Switzerland (55:10). While Collins lost contact to the lead on the second half of the beautiful and flat but windy course, Diederen got off the bike in first place. Albert was only 1:02 behind, Van Berkel reached T2 together with Hoffman and Stein 3:03 down. Kyle Buckingham (RSA) was in a good position, too. He was 3:36 down ahead of Germany’s Christian Kramer (+4:11) and Trautmann (+6:19). Diederen then led the race on the first of four run laps, but he hit the wall after 13 kilometers and started loosing time. Albert took over again from the Dutch athlete while a fast running due was already in sight: Hoffman and Van Berkel. Those two ran shoulder to shoulder for the first half of the marathon. Through 18 kilometers, Hoffman and Van Berkel passed Albert for the lead, and right at the half-way mark the American started to break away from his Australian shadow. “The crowd boomed me away,” said Hoffman talking about a marathon of 2:45:50 and a demonstration of consistency. Van Berkel never gave up in second place, but he couldn’t touch the American leader anyway. “I settled in, and I really felt like being at home,” said Hoffman after the race, “I’m definitely coming back next year.” Hoffman earned the result of “a hard winter’s work” ahead of Van Berkel and a strong Estonian. Although Trautmann looked set to cross the finish line in third place, Albert outsprinted the local hero in the final kilometre.